Thirty years ago this summer, I moved to Madison, Wisconsin, and discovered an indie radio station with a playlist of songs that sounded nothing like the AM and FM radio I’d grown up with. Prime listening time was roughly 2 to 4 p.m. weekdays, the down time between working out and heading to work. That’s when the volunteer DJs on WORT-FM — Back Porch Radio — dropped rock, funk, R&B, hip-hop, soul, punk and country into their free-form, cutting-edge shows. That astonishing mix often left my head spinning, barely able to match song with artist. One day, I remained coherent enough to match a band name to something I’d heard on WORT. Then I headed down to State Street to buy “Sundown” by Rank and File. It was — and is — a crisp, sunny, spirited revival of the Bakersfield country sound done by some California guys who came together in Austin, Texas, in the early ’80s. It fell into the cowpunk genre, but it was punk only in that brothers Chip and Tony Kinman put together Rank and File after their punk band (the Dils) broke up, and only in that a third member, Alejandro Escovedo, also came from a punk band (the Nuns). Having grown up watching the Glen Campbell and Johnny Cash variety shows, country always had a place at our table. Amid all that adventurous and sometimes intimidating music on WORT, “Sundown” was accessible, something vaguely familiar. “Sundown” is one of those records that captures a certain time in my life. I drop it on the turntable, and the sense that I am exploring brave new worlds comes rushing back. Side 1, which we have for you tonight, plays like a single song in my head. I played it that often. “Amanda Ruth,” “(Glad I’m) Not In Love,” “Rank And File” and “The Conductor Wore Black,” Rank and File, from “Sundown,” 1982. This is Side 1. It runs 13:46. It’s out of print but is available digitally on “Rank and File: The Slash Years,” a 2007 release with “Sundown” and “Long Gone Dead,” the first two Rank and File albums. That crisp, sunny, spirited moment was fleeting, relatively speaking. Escovedo left after “Sundown” and went on to a fine solo career. 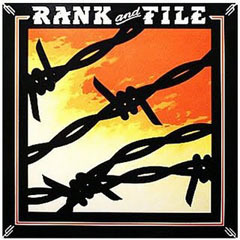 Rank and File put out only two more albums, doing both with session musicians. I once had the second album, “Long Gone Dead” from 1984, which some people like. I remember nothing about it. The band broke up in 1987. The Kinman brothers then formed Blackbird, a synth-pop group, then by the mid-’90s had wandered back to cowpunk and eventually back to punk. If you’ve been a regular visitor to our home blog — AM, Then FM — you know we have a particular interest in Wisconsin bands of the ’70s. After all, we were growing up there at the time. Tonight’s side on The Midnight Tracker is from one such record. Soup was a highly-regarded psych-blues-rock trio out of Appleton, Wisconsin, as the ’60s turned to the ’70s. It was led by Doug Yankus, a tremendous guitarist who wrote many original songs. So says Mark Everist, who in the early ’70s was the lead singer for Clicker, another of those Wisconsin bands, and other groups. Yankus started putting together bands when he was in high school in Appleton in the early ’60s. His first significant group was Private Property of Digil, a psych-blues-rock quartet that came together in 1965. PPOD was big regionally but only that. In 1968, it broke up. Then came Soup. It had Yankus on guitar, PPOD drummer David Faas on bass and a new drummer, Rob Griffith. Soup was sensational. It’s said that Jimi Hendrix checked them out. (Could be. He played a show at the Milwaukee Auditorium on May 1, 1970.) It’s said that Eric Clapton checked them out after leaving Cream and raved about Yankus’ guitar work. Could be. Soup had that kind of buzz. Rock magazine offered that praise in 1970. Yet despite their growing popularity, Soup had nothing to offer fans except their memorable live shows. So they put together an LP that had a live side and some underproduced demos on the other side. They mimeographed an information sheet, stuck it inside, put it all in a plain brown wrapper and sold it at shows, head shops and a few record stores for $2 or $3. I’ve seen that record while digging, but usually for about $100, way beyond my price range. In 1971, at the peak of its popularity and having played an audition night at the Fillmore East in New York, Soup released “The Album Soup.” A more polished LP, it came out on the Big Tree label. I’d come across it while digging for records around Wisconsin but never for less than $20, and never when that fit my budget. I found it recently at a nice price. 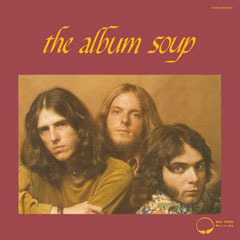 “The Album Soup” consists of 10 songs written by Yankus. Whether it’s representative of the songs they played live, I can’t say. I never saw Soup. Maybe my friends Mark (mentioned above) or Larry (who saw them on a bill with Crow and Oz, another Wisconsin band) or Bob (who chatted up Yankus when Soup played in our hometown) or JB (who saw them at a post-prom party in 1977) would know. In any case, enjoy this rare slice of Wisconsin psych-blues-rock. “Dance Magic Woman,” “Don’t Be Lonely,” “Rock and Roll Lady,” “Many Lovers Dance Inside Your Head” and “To Keep Peace,” Soup, from “The Album Soup,” 1971. It’s out of print. This is Side 1. It runs 21:21. From left, that’s Rob Griffiths, David Faas and Doug Yankus on the cover. Yankus died in California in September 1982 of complications of diabetes. Seven years later, Hiatt dedicated “Y’all Caught?” (a compilation of his early songs) to Yankus’ memory. Griffith also has died. Faas lives in Madison, Wisconsin, and has played with folk singer Jim Wachtendonk.